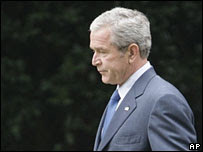 George Bush has vetoed a bill passed by large majorities in both the House and the Senate which would have provided health care insurance to some 10 million children. What were the Senate and the House thinking? We don't need no health care; we need another war! US President George W Bush has vetoed a bill to expand a children's healthcare insurance scheme, after it was passed with a large majority in the Senate. Mr Bush argues it takes the programme beyond its original purpose of insuring children from low-income families. Children's health insurance is set to be a campaign issue in next year's elections, analysts say. Eighteen Republican senators joined Democrats last week in passing the legislation by a 67-29 vote. But the House of Representatives, which approved the bill by 265-159, was well short of the two-thirds majority needed to override a veto. There's already a two-thirds majority in the Senate (which is more or less evenly split). But the House (with its Democratic majority) is 18 votes short of an override. What's wrong with this picture? Nothing! Screw the kids; let's have another war!